One of the unique attributes of the FujiFilm X-Series is the way the color pixels are laid out on the sensor. Most color digital sensors have a pattern of red, green and blue pixels. Without going into great scientific detail, there are more green pixels than red or blue, but there is still a pattern in the way the pixels are laid out. However, the Fuji X-Series is different. Instead of a pattern, the same number of red, green and blue pixels are used, but in a random order. Fuji says they used the same randomness as film grains, which is possible given their long-time work in the film industry. So, what do we gain by this randomness? The point of this change in the sensor layout is dealing with Moire. Moire is a condition that exists when a fine lined pattern is captured with a digital sensor. If the fine lines are so think that they approach the width of a pixel in the sensor, the line cannot be drawn with the proper mix of colors. I.e, no two or three pixels make up the line, so no luminosity values exist for all three red, green and blue values for the image of the line. Thus, one point on the line may be a shade of red, the next point may be a shade of green and the next a shade of blue. Viewing the resulting image on a computer screen shows the fine lined pattern as a rainbow of red, green and blue. Note that Moire is based on the pixel size of the sensor, not the megapixel size or quality of the sensor. While Adobe Lightroom has a brush feature to help remove this problem, it can not easily be removed and is done so at a loss of color, contrast and detail. The best solution is not to have any Moire to begin with. Not having had the time to run a real test, I did end up with an image today that gave me the first opportunity to review what I would expect to have been a Moire problem. 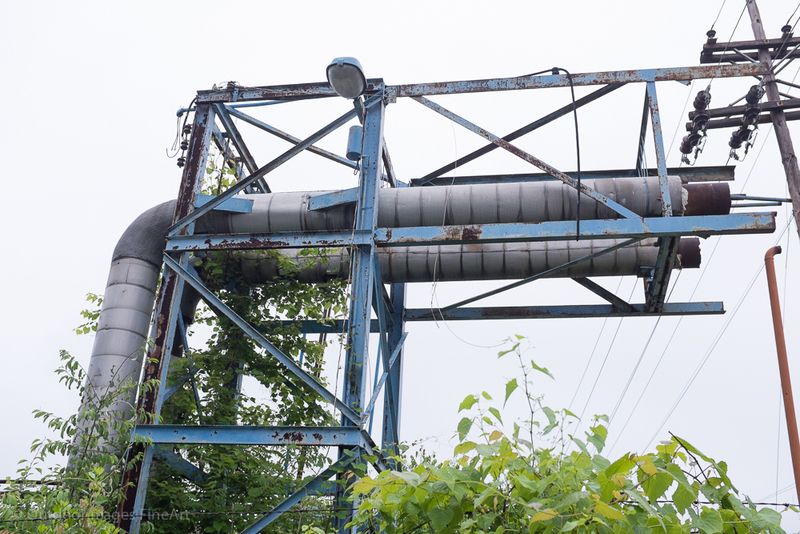 The image below is of a pipe that was used at one of the old cotton mills near my office. The two areas we will review are the street light lens and the horizontal piping. 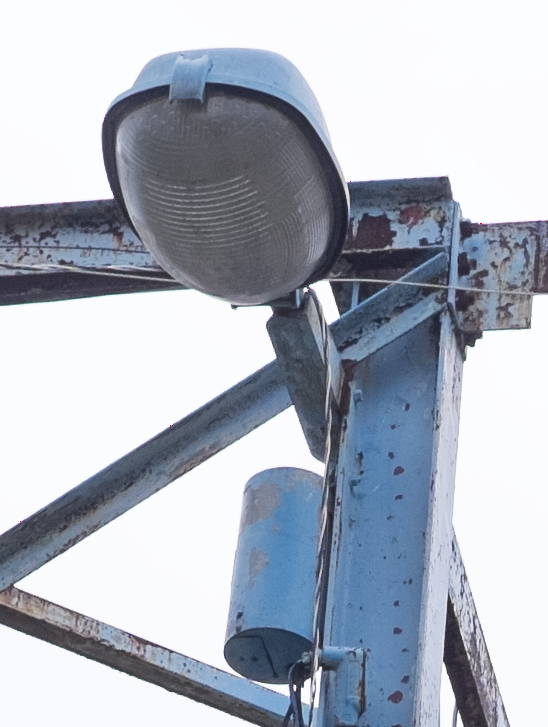 Notice how the lines on the street light lens are solid colors (click on the image to view it at 100%). There does not appear to be any drift of the lens color. This image is at 100% of the pixel view, although you must click on the image to view the full file. Also note that I used the RAW files here in Adobe Lightroom. I do not know what processing is done to produce the JPEG in the X100s, so it wasn’t used for this purpose. I do know that the RAW file has no such processing to eliminate the Moire, so the test, if the lines are small enough that they would have caused Moire in a normal sensor, is valid. Next we’ll look at the piping which has horizontal details which, in my opinion, appear finer than the street light lens lines. You may think that the piping lines or the street light lens lines are not small enough to have caused Moire, but given the wide angle of the lens and the distance of the lines from the sensor, I believe they are. Again, this was not a planned test or I would have brought a second camera to try and test the theory. I encourage someone to try this and I may if I find the time. 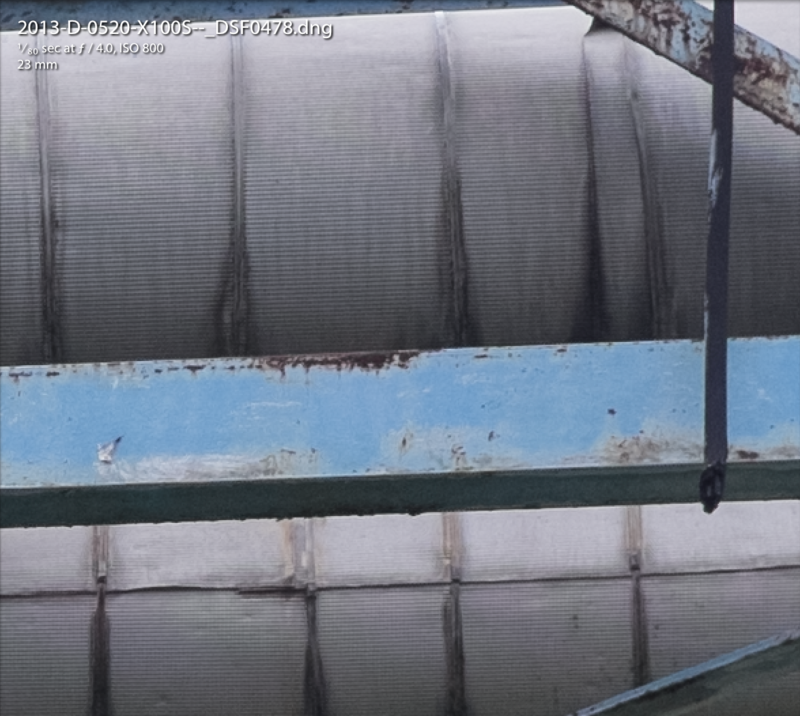 Notice the horizontal lines at 100% pixel view (Click on this image to view it at 100%). If you see any Moire in the post view, it is most likely due to the interpolation of the image in the viewing software. You should only review this result with the full image. I was also interested in more detail, so I saved a 200% pixel view. It is important to note the Adobe Lightroom interpolates the pixels in order to show a view greater than 100%. However, my hope is that in making that interpolation, should there be any Moire, the problem would only be compounded. Again, be sure to click on the image and view the full size. 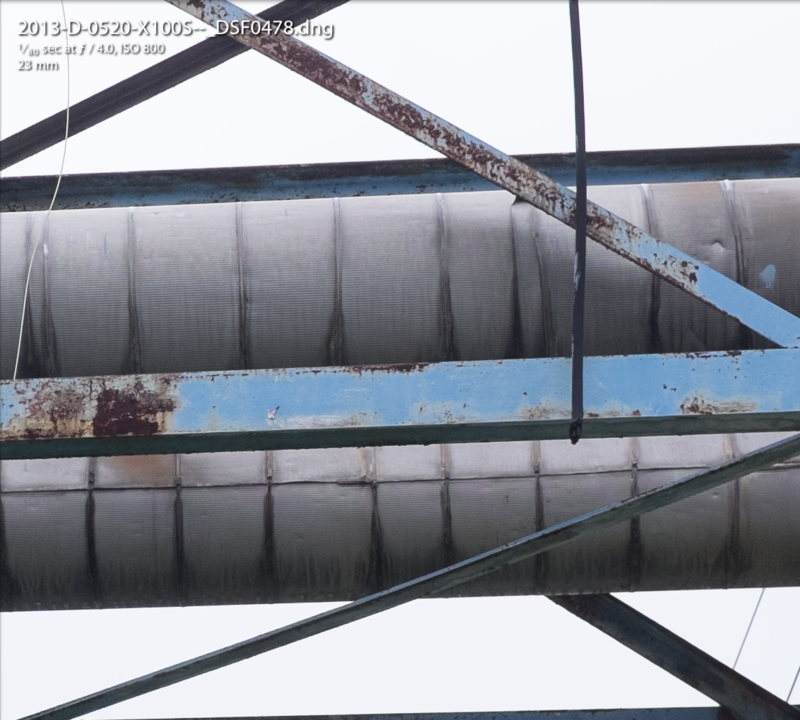 I see some slight coloration, although I believe the yellow and red tinting is from the grey metallic pipe and the overcast day. I cannot be sure. What I am sure of is that the image detail on the pipes came out pleasing and could be printed with no ill effect of coloring. I did not post it here, but the JPEG’s came out just as wonderful. I believe the concept that Fuji presents for the X-Series cameras with the randomized pixel colors is a scientifically sound principle. Clearly the randomness is important so that normal images are not degraded in color or detail. However, they seemed to have succeeded in their quest. I would like to perform a real test rather than just have an accidental image that would lend itself to review. But, in general, I feel safe about the results in fine level details using the X100s. newest Safari? This great site hardly ever used to do this previously. Oliver, thanks for the note! I did start using a different theme that had faster load times and was a little less cluttered. I use a mac and most of my work is done through Safari, and I noticed some images did not seem to load all the way. I am not sure if that was my internet connect, web server getting maintenance or something else. I updated the theme to the most current and completely flushed the web server cache. I hope the problem has been eliminated, but if not, send me more specific detail and I will fix it. Thanks again!